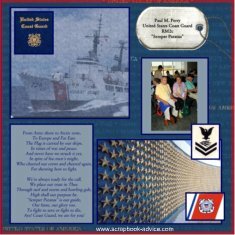 At this time, this is our first of our Coast Guard Scrapbook Layouts, but I and my readers would certainly appreciate it if you would post your own for us to share and honor our Coast Guard Heroes. I recently met this gentleman, a World War II Coast Guard service member on an Honor Flight to Washington, DC and this was one of the pages that I did for his Honor Flight Scrapbook. You will be helping my readers with great ideas and sharing your art work with other scrappin' enthusiasts if you will add your Coast Guard Scrapbook layout or Coast Guard Cards to the postings below. Also please let us know about any Coast Guard Embellishment you have made or have found and where you found them as they seem to be a little scarce. Once you have submitted your layout, it will be reviewed by our Moderator and Posted to your own page on the scrapbook-advice.com website. Then you will be sent an e-mail with a link to your page, which you can send to your family and friends for them to comment and rate your page. Two weeks after we have received 10 scrapbook entries, we will pick the highest rated page as the winner and you will receive a scrapbook supply or gift card. We will email the winner and will need for you to supply your snail mail address so we can get the card out to you promptly. You can enter as up to 8 times. We will also take Coast Guard related Cards as well. Thanks so much. We also have other Readers Layout Galleries for other Military related layouts for your Air Force Scrapbook Layouts, Army Scrapbook Layouts, Marine Scrapbook Layouts, Firefighter Layout Gallery, or Police or Sheriff Scrapbook Layouts. Have a Coast Guard Scrapbook Layout you would like to share? Show us your personal tribute to honor the service of your special Coast Guard Hero. Whether its a Scrapbook Layout or a card with a Coast Guard theme, we'd love to showcase it on our website www.scrapbook-advice.com. Enter the Title: Example "My Coast Guard Scrapbook Hero Layout about my Dad"